“It’s a totally different year and dynamic for him. Even though he was ‘the guy,’ he had a couple elder statesmen in the (quarterback) room that he always showed 100-percent respect to. Now, he’s not only ‘the guy,’ he’s the elder statesman. It’s a different dynamic for him which I think he’s relishing. We’re excited about that aspect of it.” — Steelers offensive coordinator Todd Haley. 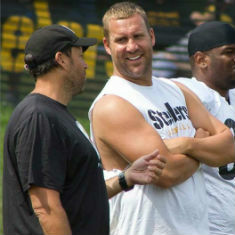 Ben Roethlisberger’s presence has been as obvious as it has been audible at St. Vincent College. In the huddle, in the meeting room, even in the cafeteria, where Roethlisberger joked the other day about exiting the pocket on a bootleg just fast enough to stay ahead of a hard-charging Steve McLendon, Roethlisberger has been as at ease as he has been involved and in charge. Apparently, the transformation of Roethlisberger from mere franchise quarterback to franchise quarterback/voice of veteran experience among the QBs agrees with him. He’s been heard from daily out on the practice field, talking with not only the other QBs but also the running backs, the tight ends and especially with the wide receivers before, during and after drills, a few of which Roethlisberger has appeared to be running at times. When something works, it’s discussed. When something doesn’t work, it’s discussed. The on-field chatter has been as consistent as the sunshine at St. Vincent. Roethlisberger’s level of engagement in what’s been taking place here has been unlike any in his nine previous camps with the Steelers. “In meeting rooms, individual drills, team drills, you’re seeing a lot different side of him than maybe you saw last year,” Haley said. “For example, (Thursday) he’s supposed to be in the no-huddle for six (plays); he’s politicking before practice to get eight. He’s excited about what he’s doing and what we’re doing and continuing to try to get this thing where we need to be. You can read more from Mr. Prisuta’s column here! *Photo taken by fan Biggie Riley, BHR Photography. You can see more of her photos, and others who have shared theirs from training camp here!